I almost forgot this card existed. So, when I was reminded of it through a post by Corky at Pack War I figured I would put up a little ditty about it. 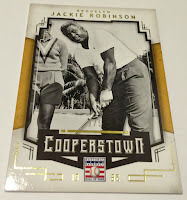 Here is a card created by Upper Deck when they were still relevant in the Baseball card hobby. Featured is the 2007 Sweet Spot Signatures "756" Asterisk card, and as you can see it attempts to take a giant jab at the reigning home run king - Barry Bonds. 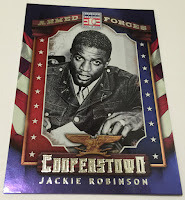 Upper Deck wanted to make a point about Barry's recent home run record by producing this card and randomly inserting them into packs. This card is currently for sale on eBay here. Once a upon a time, this card sold for upwards of a $1,000 on eBay (as indicated in a late 2007 story I wrote here). Today, you can buy it for $475.00, and that might be pushing it. After all, the card is not numbered and it is known that more than one card was produced - likely multiple copies exist. Furthermore, as time passes by the relevance and schadenfreude this card once created has faded. Now, it is a mere footnote... Or *asterisk, if you will. 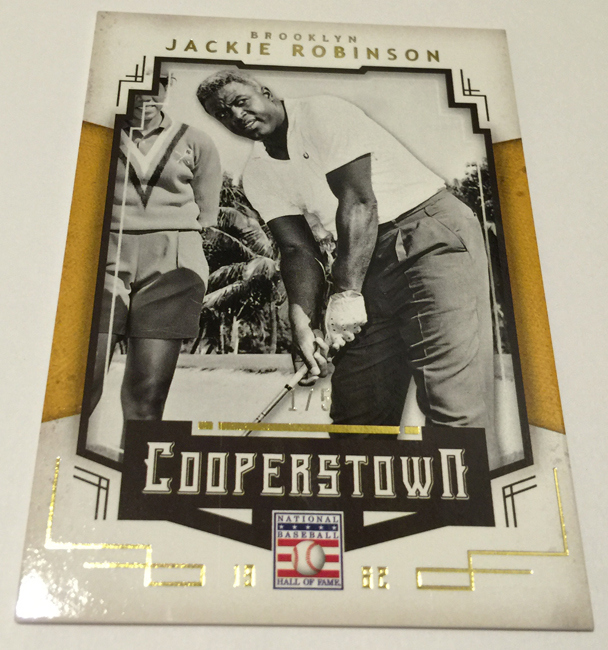 This coming Wednesday Panini will be releasing their 2015 Cooperstown Baseball set. Check out a couple of Jackie Robinson cards above. Go here to see a whole boatload of preview pics from the set. Via Matthew Moreno at Dodgers Digest, "SportsNet LA Enjoying Record Ratings Following Merger With Charter." Via Barry Lewis at Tulsa World, "Tommy Lasorda can stand the (Tulsa) heat." Some good news on the draft signing front. Via Jon Heyman on twitter, the Dodgers have signed their 2015 1st round pick Walker Buehler (24th overall). BTW, Buehler also needs Tommy John Surgery, via Heyman's twitter. walker buehler, vandy pitcher, said to agree to dodgers deal. pick No. 24. it'll be under the $2,094,400 slot. Well this is disappointing, via his twitter. Funkhouser was a Dodger 2nd 2015 first round draft pick - 35th overall. BTW, the the Dodgers will get a compensation pick in 2016 - a 36th pick. Via Matthew Moreno at Dodgers Nation, "Dodgers And Nationals Players Tweet About Lighting Failure." Via Ron Cervenka at Think Blue LA, "Arruebarrena promoted to Double-A Tulsa." Via Matt Flate at Heartbreaking Cards of Staggering Genius, "Visiting The Topps Pop Culture Exhibit At The Louisville Slugger Museum." There are a whole bunch of great photos so go here to check them out.